To what lengths do you go to give away your surplus produce at this time of year? Are you the proverbial neighbor who rings the doorbell and runs, leaving behind a 4-lb. squash that will take all afternoon to grate for zucchini fritters? Do you casually drop by a friend’s house and “forget” a basket of plums that you don’t have time to make into jam? Do you foist carrot salads upon unsuspecting dinner hosts? I admit nothing. You can take a grated carrot salad in any direction, but I think olive oil, lemon–more lemon than you might think–and salt are a nice place to start. I find that lots of lemon helps to enhance and balance the sweetness of the carrots. The idea of adding cumin and smoked paprika came from this Moroccan carrot salad recipe, and each contributes a little hint of smoke and mystery to the salad’s flavor. 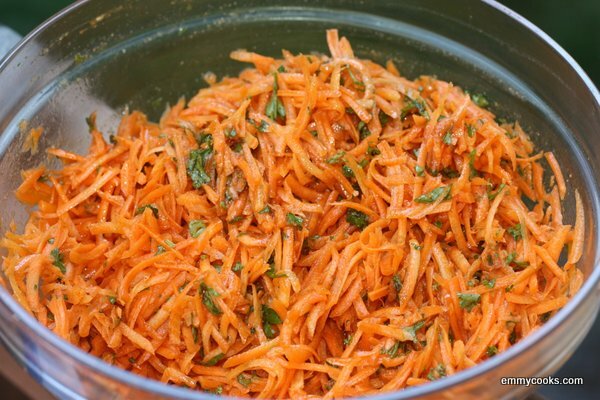 Lemony Carrot Salad with Cumin and Smoked Paprika: Peel and coarsely grate a pound of carrots. Combine in a serving bowl with a nice pour of good olive oil, the juice of two (or more) juicy small lemons, a big handful of chopped parsley, two pressed cloves of garlic, 1 tsp. each cumin and smoked paprika (hot or sweet, your choice), and plenty of salt. Toss well and let sit for at least an hour to allow the flavors to blend. Toss again and taste, adding more salt, lemon, or olive oil to taste before serving. Looks delicious and no mayo anywhere in sight! Thanks for sharing! LOL. Works for me! I mean it REALLY works for me. Thanks for so many wonderful dishes to choose from. Ha, I’m glad I’m not the only one who makes a carrot salad, and yes, little sis, I’m the guilty one who makes it with vegenaise and raisins. Emmy’s version looks a lot brighter and healthier than mine! Somer, I know your carrot salad is delicious too! In a sandwich with some avocado, maybe? Mmm. You’re right! That would be delicious. Did you try this? https://emmycooks.com/2012/07/03/summer-crunch-salad-with-feta-mint-and-lime/ Some combination of the two would be great. Lemon juice over carrots or lettuce is really refreshing in the summer. Cumin and smoked paprika..2 of my most used ingredients! I must make this! Looks so good! Yum! What are your favorite uses for smoked paparika? I use it in my lentil soup recipes, in quinoa and also over roasted sweet potatoes is FABULOUS!! And suddenly I can’t believe I don’t usually put smoked paprika in my lentil soup. Or on my sweet potato fries. All that is about to change. :) Thank you! wow, the flavor must be amazing – I shall try it! Thanks so much for sharing, beautiful blog post as always! Oh, and I have tons and tons and tons of carrots. We recently got a 5-lb. bag as just one of the items in our CSA box! Wow, that must be intense! I tend to use it slightly more sparingly. :) What do you use it in? I really like it but don’t use it that often. I use it in goulash, patatas revolconas, my chorizo pasta… ummmm – can’t remember what else.